Slippery Elm Bark, or Ulmus Rubra, is an herb derived from the inner part of the elm bark and is usually used as a finely ground powder. It is considered to be a safe and gentle herb and is allergen free. The inner bark, normally ground into a powder has been used for a variety of medicinal purposes including soothing sore throats and calming coughs. The powdered form is commonly made into a tea with sweetener and milk. 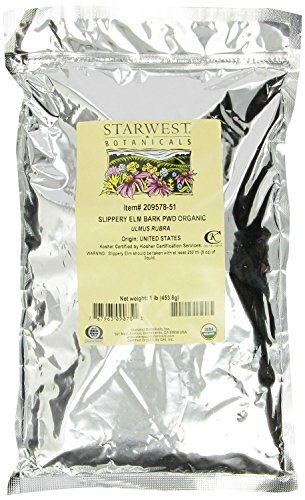 Why Choose Starwest Organic Slippery Elm Bark Powder? Here at Starwest Botanicals, our certified organic Slippery Elm Bark Powder is 100% pure, non-GMO, Gluten-free, and kosher. All of our Slippery Elm Bark Powder is from the U.S. and guaranteed 100% pure and natural. You can taste the difference! Still Not Convinced? You can rest easy knowing that every purchase comes with the Starwest Botanicals guarantee. 100% satisfaction or we will give you a full refund or exchange the product as per your request. CERTIFIED & REPUTABLE: Our Slippery Elm Bark powder is certified organic, non-GMO, and Gluten-free. ENJOY THE HEALTH BENEFITS: Slippery Elm Bark Powder is known to soothe the throat and reduce coughing. VERSATILITY OF USE : Slippery Elm Powder can be made into a tea, taken as a supplement, and more. THE STARWEST BRAND: We manufacture and test all products at our U.S. facilities to ensure safety.